Now this is a higher-$$$ item than I'm used to seeing on CL! Link Posted: Fri Nov 02, 2018 11:04 pm Post subject: Now this is a higher-$$$ item than I'm used to seeing on CL! Original MSRP on that projector was $35K. No idea on the current street price, but is $17.9K really that far out of whack? Considering the about to come out starting models with native 4K LCoS panels from JVC with have an MSRP of $6K I would say yes, it is asking a lot. You're probably referring to the JVC RS3000/NX9 RS2000/N7 RS1000/N5. They're lamp based projectors (not laser) so native contrast isn't as good, and they're "only" 2200 lumen (not 3000). They're also half the size/weight. MSRP on the top of the line RS3000 is $18K. The RS4500 is a completely different market segment. Most people would be perfectly happy with an RS3000/2000/1000 of course, but comparing is a bit difficult. There are probably more than a couple of people that would buy the 4500 at that price. As Kal said, it was originally $35k. Not sure what the going rate is now. JVC said at Cedia that it is still their top pj even with the new models coming out. New it's still $35k, at least at projectorpeople.com. I don't know the street price for a used unit. Lots of negatives for this model given the price point. ● Laser dimming feature performance inconsistent and problematic (Mode 2 particularly). ● Over 40% reduction in brightness output with BT.2020 colour filter. ● Prone to running hot and when it does the fans switch to 'turbo' mode and the operating noise hits the roof. MAXIMUM operating noise (when running hot): HIGH LASER [Max 70dB / 1m 63dB / 2m 56dB] | MEDIUM LASER [Max 63dB / 1m 57dB / 2m 54dB] | LOW LASER [Max 56dB / 1m 54dB / 2m 51dB]. That said, operating noise is easily remedied and becomes a non-issue via simply installing the projector into an air conditioned hush box/projection booth or outside the room. ● Outperformed in all respects with DCI-P3 colour, bar resolution, by 'lesser' models JVC DLA-X7500 (£6,100 RRP) and JVC DLA-X9500 (£9,100 RRP). Where with respect to resolution the difference is not significantly perceivably different being native 4K versus eShift 4K. LOL you made me search for the review. That is Nigel's (Arrow) review. I am not sure if that was before or after the updates. He went to CES to preview it when it came out and was disappointed. 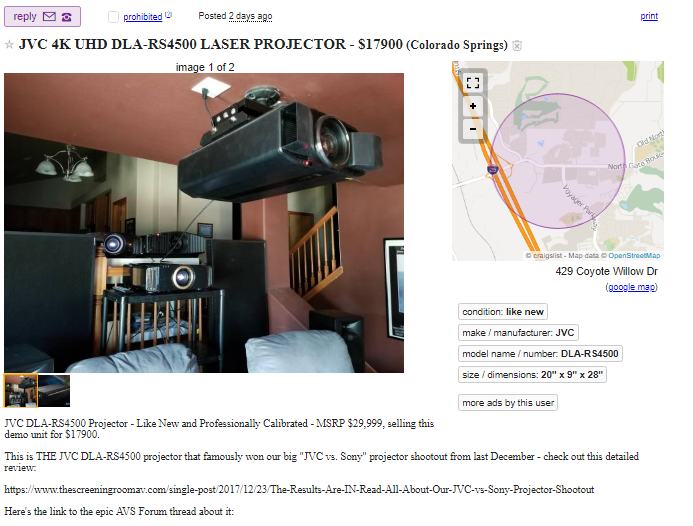 Now, if you ask him he would say it is a great projector. Read Kris Deering's review in S&V. Kris sold his 4500, because someone made him a good deal. He told me that he went back and forth on the deal, but relented because he thought the 640 had enough light output for his screen size. Despite that, as of Cedia he was considering either buying another 4500 or the new 3000. He is supposed to be receiving a review unit of the 3000. Nigel is really gung ho about the 3000. He grabbed me at Cedia and wanted to get my opinion of it first thing. I thought it looked good, but I saw an image stutter or shake that only one or two other people saw. Might be a pre-production issue. If you want another good Nigel read, then check him, Art and Ken Whitcombs trip to Christie in the AVS ultra high forum. He PMed me about and like his review said he thinks it is without peer. On/off contrast and light output that no pj can match.